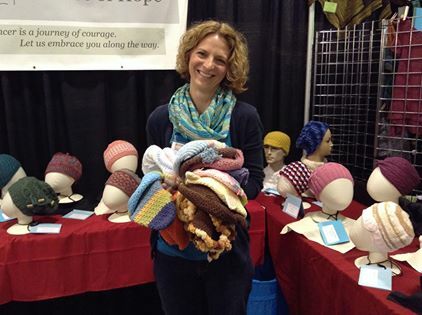 A few weeks ago I volunteered to help Pam with Halos of Hope and the booth at Stitches South (Stitches) in Atlanta. For those not familiar with a Stitches event, it is an event put on by Knitting Universe; basically a yarnie convention. There are classes for knitters and crocheters, a fashion show and a market where you can buy yarn (surprise!) but lots of other vendors are there too; local yarn shops will get booths, manufacturers of various knit and/or crochet related gadgets, local guilds, yarn companies and many more. Halos of Hope had a booth to promote the charity, sell fundraising patterns and collect hats. Last year Pam put out a call to help man the booth so she could take a break or two and I eagerly offered. When she asked again this year, I was the first to raise my hand. This is me donating hats I made. I absolutely love experiencing the stories of those who stop by. Although many are happy, some are sad. Those who told stories of loved ones who lost the battle to cancer made my heart weep. But being able to talk of their loved one, if only to a stranger and for a few minutes, helps them heal and allows their memory to live on. One woman came by and told how her husband was recently diagnosed. Pam instantly pulled out the big bin of donated hats and found some manly ones for him. I love the stories of the survivors who stop by and the nurses who work in centers where the patients receive donated hats. And I love when others come by with hats they made, whatever their motivation to knit, crochet or sew for Halos of Hope may be, they come with lovingly handmade hats to bring hope to others who need it most. This year the Halos booth was located across from the Cascade Yarn booth. 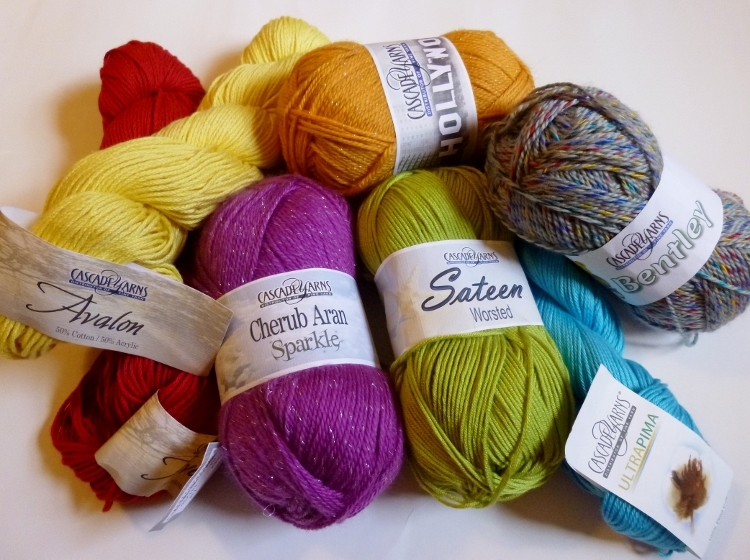 I recently had the pleasure to work with Cascade Yarn’s Avalon when I designed the Picture Perfect Baby Blanket or Throw. It is a lovely super-soft cotton yarn. Pam introduced me Shannon Dunbabin with Cascade Yarn-a very nice woman who could knit without looking at her work-an accomplishment I hope to achieve one day with my crocheting. The event took place just south of Atlanta which is about an hour and a half drive from where I live. So I made a day of it and spent a little bit of time enjoying the market before and after my shift was done. After I strolled around the market and returned to the booth to collect my things, I found a bag full of yarn samples Shannon had given Pam to share with me! How sweet! and when I walked over to thank her, she gave me another beautiful hank of yarn! WOW! This entry was posted in Charitable Crochet, General Interest and tagged charity, chemo, craft, crochet, Halos of Hope, hat, knit, Stitches South, yarn. Bookmark the permalink. What a great project. Thank you for his post. I am a cancer survivor and have thought about making hats for the cancer center where I was treated. (When I was going through treatment, there were no donated hats available.) You’ve inspired me to give it a try.